One disturbing trend I have found in my long study of Spiritual Formation and discipleship is how quickly these ideas can be reduced to a listing of spiritual disciplines or a discussion on spirituality that seems very foreign and inaccessible. Then someone like Ruth Haley Barton comes along and Spiritual Formation moves away from what normally gets presented. In its place is a life with Jesus that seems absolutely necessary for a truly Christian life. The practice of solitude and silence may be foreign to many people, but Barton explains why it is essential to her life and to every serious Christian. I don’t know how she does it but her writing is always accessible, down to earth, and doable. She explains through personal experience and quality research, why solitude and silence are so needed. 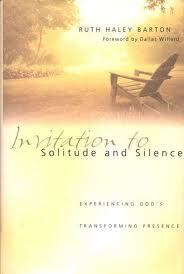 When you read this book, you are left with a glimpse into an inviting world of closeness with God. Solitude and silence may be awkward at first but Barton shows the reader why that awkwardness is worth it in the end. If your exposure to Christian Spiritual Formation has left you feeling dry or guilty, give this book a try. You will be grateful you did. Hieromonk Alexander, to offer his insight on the subject. Hieromonk Alexander is a priest in the Russian Orthodox Abroad and lives and works at the Hermitage of the Holy Cross, a monastery in rural West Virginia. Solitude and Silence are valuable tools for every Christian who seeks to withdraw from time to time, or even daily, from the worldly cares which can so easily drown out the still small voice of God. It is important however that we understand these tools theologically so that we benefit from them and don’t simply waste our time – or worse – fall into spiritual delusions that will harm us and our relationship with God. Following the example of our Lord who “went up on a high mountain to pray, ” Christians from apostolic times have sought out secluded places to pray. When these early Christians went out to quiet places to pray, removing themselves from the company of men, what exactly did they do? We understand from tradition that they did primarily three things: They prayed fervent prayers of repentance (for we all sin and fall short of the glory of God, and by habit of sin we have become spiritually sick with “sinful passions”), they prayed in such a way as to unite their mind to their heart, and they called upon the name of the Lord. When we say that they united their mind with their heart, what do we mean? The mind is often directed outwards – toward circumstances, fearful possibilities, toward the past or the future or perhaps concerns about how other people view us. All these thoughts with their associated emotional and spiritual baggage not only prevent the mind from communing with the heart of a man (the center of his spiritual life and relationship to God), they even send pollution into the heart. When we think unclean thoughts our heart is polluted along with our mind. Inasmuch as we seek in our Christian life a pure heart as we know such a thing is pleasing to God, we seek silence and solitude in order to relieve the mind of the many impressions which it encounters through the five senses. When the mind begins to calm down we can then focus the mind’s attention on our heart, and begin a sincere prayer of repentance. In the Orthodox tradition this prayer usually takes the form of the “Jesus Prayer” which is “Lord Jesus Christ Son of God, have mercy on me a sinner.” Thus we imitate the early Christians who were taught by Jesus Christ himself to call upon the name of the Lord. We have as the object of our silence and solitude HEARTFELT AND SINCERE PRAYER. And by such prayer we hope to call down upon ourselves, without hysteria or manufactured emotion, the grace filled energies of God. One short attempt at silence in solitude will only be frustrating for us. When we first begin to be silent and alone, we can have various reactions. Some become disturbed, feeling the impulse to call someone or check their email of make lists. It can take time and a lot of effort to become used to silence and solitude. If we persevere in this effort and understand our goal properly, these tools can be transformative for every Christian who seeks to purify his heart and please the Lord.